In my Coloring With Arty™ books, I spent a lot of time on the drawings. I want any age to be able to enjoy the lines, the shapes, and the characters. Those few moments you allow yourself to get lost so you can find your way back again through coloring can feel really good. 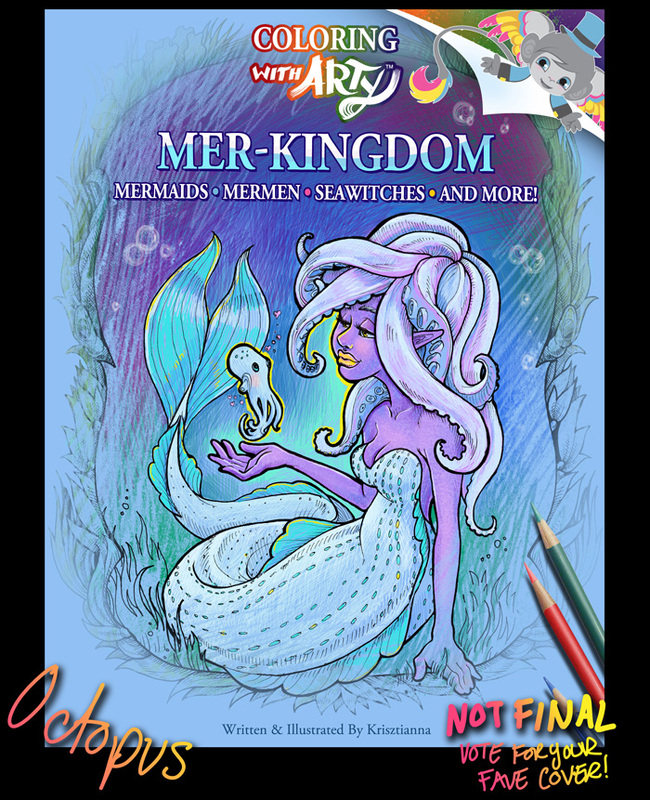 So, if you like magical creatures from around the world, here is a coloring book for you. If you like merpeople and biology, you will enjoy this one. Here is a great little video on how important taking a moment for yourself actually is. 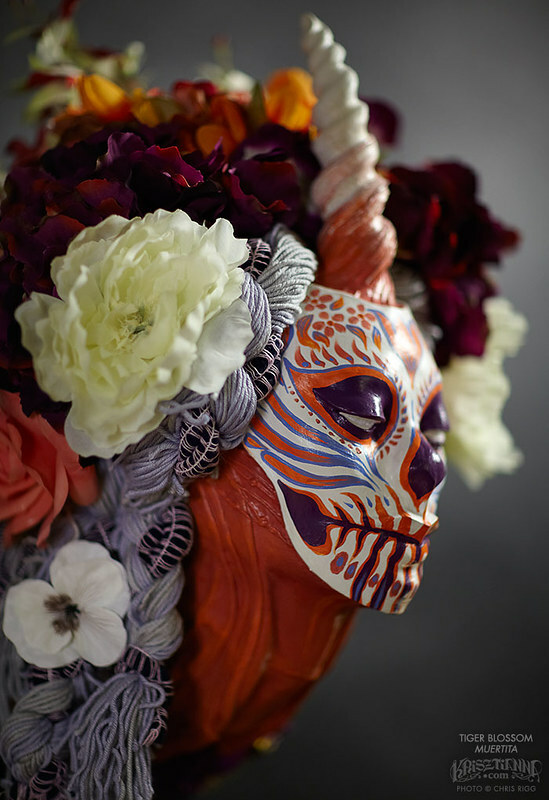 Thank you to everyone that came out to Refuse To Destroy mixed media group show! It was wonderful. Here are some photos. My very first group gallery show that was as long as week! 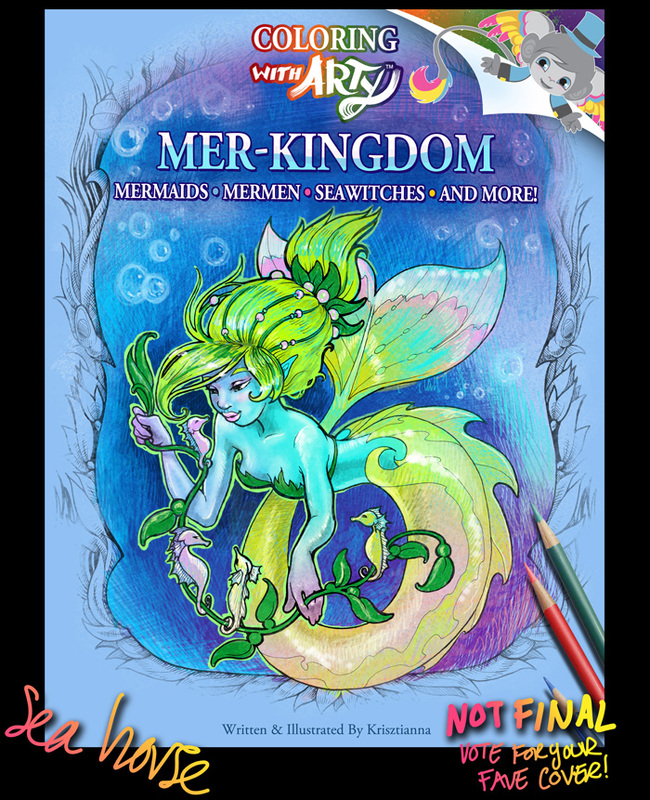 Also, thank you to those buying my biology + mermaid = awesome Mer-kingdom Coloring Book on Amazon! Such encouragement to make more!! On the note of making more, I am taking a few days off from making more. 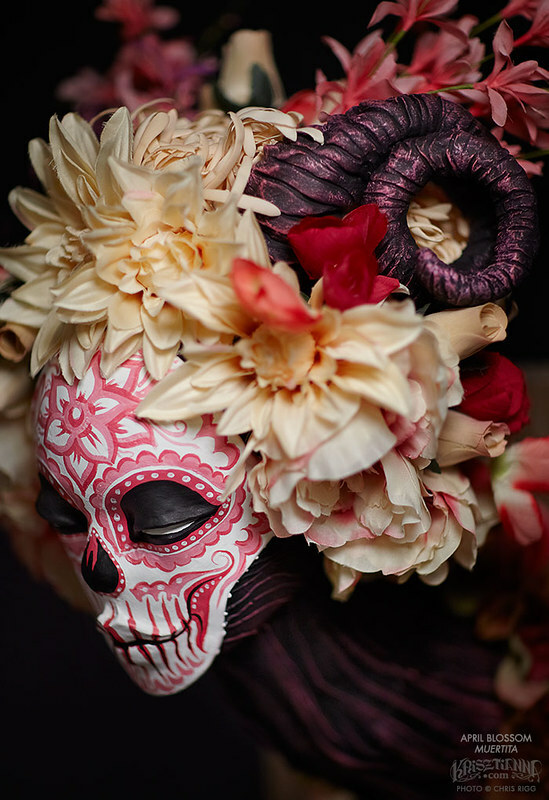 Reading webcomics, continue reading Sandman and Saga through COMIXOLOGY, imbibe in the beauty of internet, and upload my newest Muertita photos for sharing. Oh, and find a new RSS feeder now that Google Reader is no longer. Chris Rigg, many thanks once again for taking amazing photos. Thank you all who read, share, respond, and color books. It’s a good feeling. There are words for it. Something like…sweetly beholden…yeah…something like that. Coloring book is done, Art Show on SATURDAY! And now the happy post I was talking about! 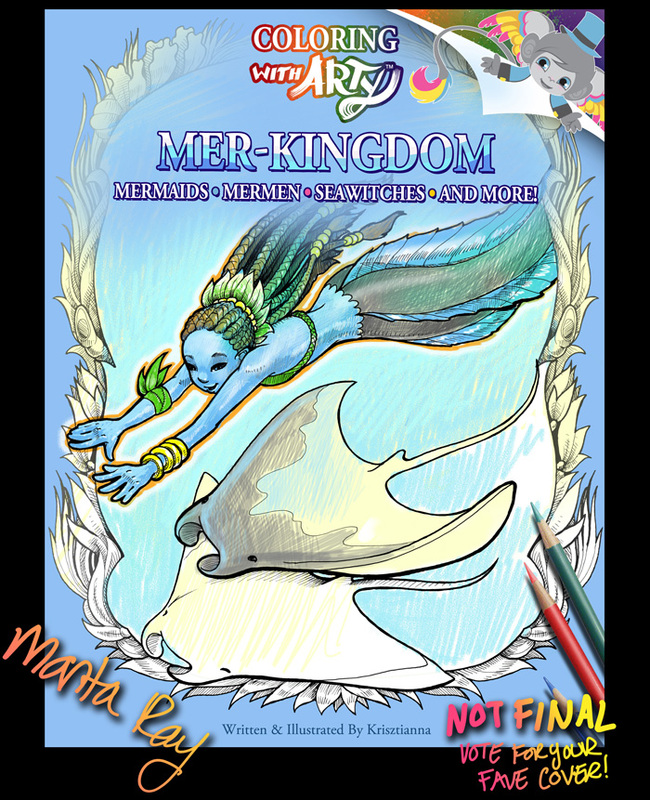 Mer-Kingdom is published and ready for your coloring skills! Refuse to Destroy : Re-Imagined, Re-Purposed & Re-used gives us an aesthetic experience of the many creative alternative uses of wasted, found and non-traditional art mediums. 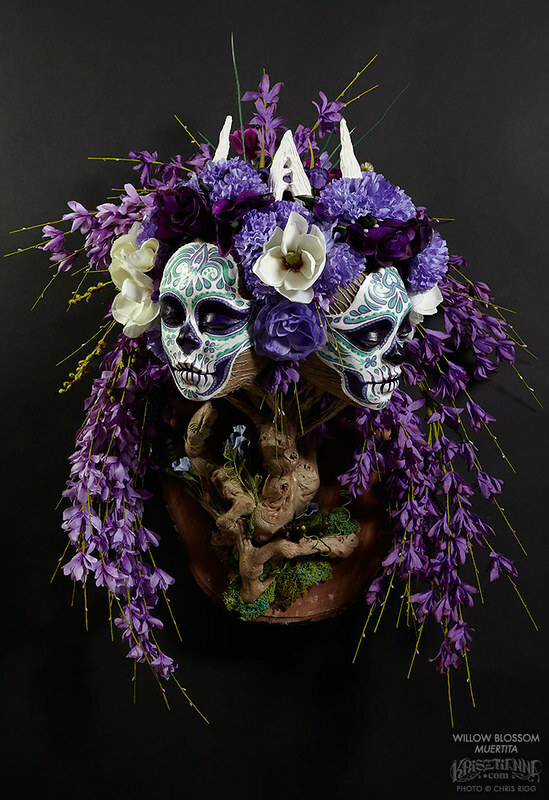 This Group Exhibition will feature artwork by over 30 artists whose artwork resides is in such mediums as interactive installations, sculpture, painting, illustration and mixed media- all using found or recycled objects. And here are a few teaser shots from an amazing photo-shoot with the talented Chris Rigg. YOU GET TO THE PICK THE COVER FOR MY NEXT COLORING BOOK! 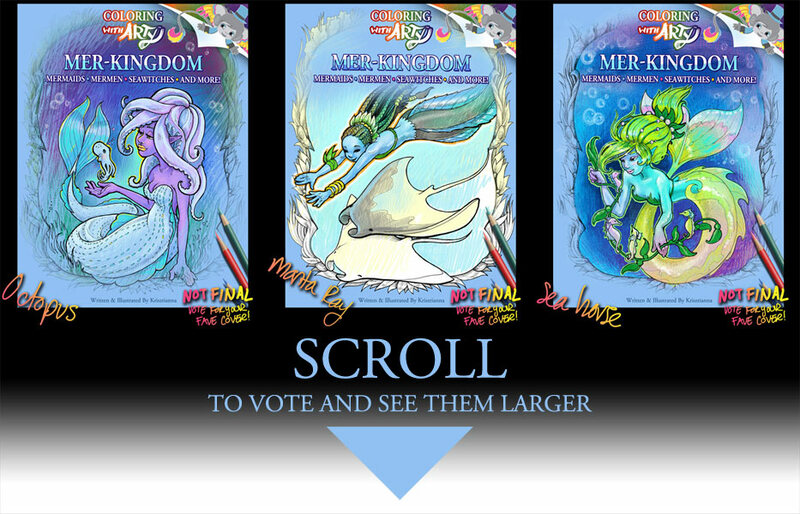 The JOY of having you guys tell me which Mermaid you think is cover material, what you think works best and why, has inspired me to LET YOU PICK THE COVER by VOTE! I will take a final tally on Saturday. Feel free to share! I’m excited! We are almost done!! It seems like an easy thing to throw around as advice to people, “Find what you love and do that for your work, then it won’t feel like work”. This makes “If you work hard, you can achieve anything” seem like the opposite – you either work really hard to get what you want, or find something you want to do and it won’t feel like work – it was all very confusing. I took it with a grain of salt. Being creative was satisfying, so I worked really hard to find creative work. Work I enjoyed still felt like work. WORK WORK WORK. And it felt good to have work, real good. Having money to eat well, travel, visit friends, play in and learn about nature…all these things fuel my deep love of making art. My art is the work I do when I’m on vacation. I am on VACATION, and doing my art, and its hard work, but it still feels like vacation. Its like a lightbulb went on in my head. This lightbulb made me want to write this post. I get it! Hard work is still important. It finishes projects, starts new ones, and keeps me productive. But the things I do in my free time, like the coloring books, the Muertitas and stories…maybe someday I can do this stuff full time. Because even though it requires hard work, it feels like a hard-core vacation. I finally get it. Finally. And I look forward to making it happen one day. Then my weekends can really be a weekend, where I go on bikerides, play video games, read books, adventure about with friends, these all make me a better artist and storyteller.